Prioritization will work properly only if as little data as possible is given high priority. 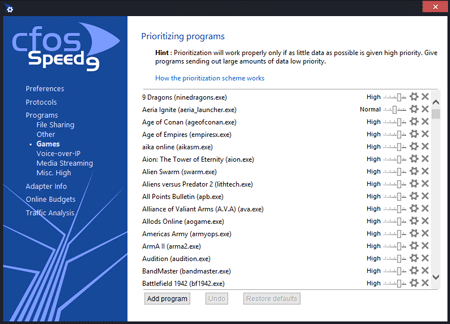 Give programs sending out large amounts of data low priority. "cFosSpeed 7.0 - Temporary Prioritization of Connections"
First cFosSpeed tries to detect the Layer 7 Protocol for each connection. If it is not detected (i.e. the protocol is UNKNOWN) or the priority of the detected protocol is "normal", then the program detection is used to determine the priority. 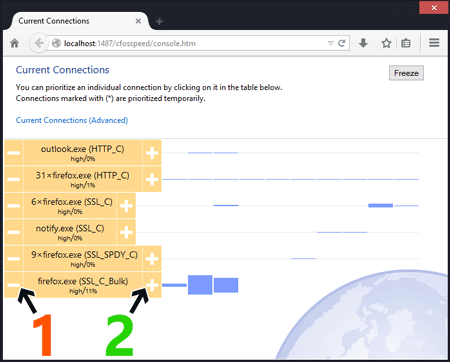 If the user agent is one of the well-known players or has the substring "player" in it, cFosSpeed categorizes the connection as HTTP_STREAM_C or HTTP_STREAM_S. Otherwise if the content-type is audio or video it categorizes the connection as BSTREAM_C or BSTREAM_S. The BSTREAM_C/S connections are prioritized as "normal" so that the actual priority is determined by the program prioritization.